Club Penguin’s “Herbert’s Revenge” Sneak Peek! Catolog Cheats, “Herbert’s Revenge” Sneak Peek, and Earth Day! When Club Penguin releases their first Earth Day party,I will have all of the cheats, hidden items, and much more posted here. The new Club Penguin April 2010 Better Igloos Catalog was released in our igloos. In this catalog, there are various styles of furniture and much more. I have collected all of the Club Penguin April 2010 Better Igloos Catalog cheats. The cheats are below. 1. Go to the 1st page of the Better Igloos catalog. 2. Click on the middle shelf in the bottom left. 2. Click on the light of the lamp in the bottom left, of the right page. 1. Go to the 2nd page of the Better Igloos catalog. 2. Click on the top of the vase in the bottom left of the page. 2. Click on the stump of the tree in the bottom right. 1. Go to the 3rd page of the Better Igloos catalog. 2. Click on the rock in the Wishing Well in the top left. 1. Go to the 4th page of the Better Igloos catalog. Those are all the cheats for the latest Better Igloos catalog. I am a huge fan of the new burgundy furniture. What were your favorite furniture items in this month’s catalog? Work continues on Club Penguin’s new Nintendo DS game, “Elite Penguin Force: Herbert’s Revenge”. It’s getting close to being finished, and it should be good to launch sometime next month. Billybob has provided everyone with a sneak peek of this brand new game. This picture looks very suspicious. I am wondering what Herbert P. Bear has going on in the left side of his cave. Earth day Party, Pin, and an Interview with…Gary?! Club penguin released their latest pin. You can find the Frog Pin by going to the Dock on Club Penguin. Here is how to get the Frog Pin on Club Penguin. Waddle over the Frog Pin. What do you think about the new Frog Pin? I wonder if Club penguin added this new pin because of the Earth day Party coming up. Frogs do control a big part of our Earth’s environment. Don’t you think this new possible free Watering Can item is going to be really sweet? We also has another sneak peek for you. I believe this new free Soil Bag item will be used to help plant new trees around the island. It will most likely be available at the Mine, check it out. I’m sure Gary has some sort of planting and recycling station in store for us around the island. I think this party will help kids learn about helping their environment and many other things. What do you think about these Earth Day party sneak peeks? Gary will you please show us your plans? Galileo Yu: Um I completely understand you but maybe a little more simpiler for the younger kids? Gary: Oh, ok trash goes here in the funnel and out comes new products here on the conveyer belt! Galileo Yu: Thank you Gary! I’m sorry for not posting in two weeks but i had uh erm a problem….anyways…. Today is April 4th, 2010 and you know what that means. Today is Easter Sunday! I would like to wish all of you a happy Easter. We hope you have fun celebrating this wonderful day with your friends and family. Recently there has been a lot of talk about the upcoming Club Penguin mission, as well as Herbert P. Bear. From reading this weeks newspaper, I have found evidence that Herbert’s evil plan will be starting very soon. If you look closely enough, you will notice Herbert was found at the Ski Lodge in the new newspaper. As you can see, they look very similar! Since Club Penguin showed a secret picture of Herbert in the newspaper, we can conclude that his evil plan is soon to come. You could find Herbert in the newspaper more than once. It seems like Herbert is going undercover wherever he goes on Club Penguin. Also how many penguins have eyebrows? like two so this must be herbert! Once you find this door, simple click on the door. Next, wait for the door to open and a part of the door will drop down. Enter this part of the door and you will load into the new room for the Club Penguin 2010 April Fools Party. Once you have entered the Dock, you will need to get tons of penguins together in order to paint a painted located at the Dock. Once this mural is painted,You have to keep throwing paitballs until you make a treasure chest. Congratulations! You’ve discovered the hidden Red Propeller Hat. Go to the Snow Forts. 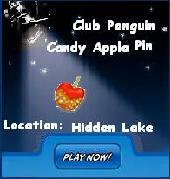 Once you have entered the new secret room of the Club Penguin 2010 April Fools Party, you will need to waddle down over to the bottom right corner of the room. Once there, click on the Jester’s Hat. Congratulations, you’ve discovered the hidden Jester’s Hat. Today on Club Penguin the new April 2010 Penguin Style Catalog was released. I have collected all of the cheats for the April 2010 Penguin Style Catalog. This catalog is filled with lots of items that have to do with saving the Earth. It looks like Club Penguin has gone green! Look below for the catalog cheats. 1. Go to the third page of the Penguin Style catalog. 2. Click on the cup on the right side. 1. Go to the fourth page of the Penguin Style catalog. 2. Click on the pink dance floor tile. 1. Go to the sixth page of the Penguin Style catalog. 1. Go to the seventh page of the Penguin Style catalog. 2. Click on the right side tree. 1. Go to the eighth page of the Penguin Style catalog. 2. Click on the recyclable bottle. 2. Click on the water bottle. 1. Go to the tenth page of the Penguin Style catalog. 2. Click on the small light of the camera. 1. Go to the eleventh page of the Penguin Style catalog. 2. Click on the edge of the tree. 2. Click on the top of the mountain. 2. Click on the tree in the top right. 1. Go to the fourteenth page of the Penguin Style catalog. 2. Click on the snowman’s nose. The Club Penguin April 2010 Penguin Style Catalog was a total success! There is a ton of new items and backgrounds. I hope our cheats were useful to you. What did you think of this month’s penguin style catalog? I am going to upload a new heading for St. patricks day here how it looks like! But I can’t seem to find were i Upload the heading ……………………………..
Club Penguin Puffle Rescue and Better Igloos Catolog! This is a pic from the Club Penguin Puffle Rescue! Thats a pic from the Club Penguin Puffle Rescue! Thats the new game which is gonna come out on Monday! Tell me what else you think the game is gonna have. Besides the sharks. What do you think will happen in the game? Do you think its connected to the upcoming new mission11? I think the puffle is doing great on that island in the picture. Dont you think? HERE IS VERY IMPORTANT NEWS: Due to the VOTE TAKEN by my Australian fans, I have post-poned the date Of my party to Tuesday! Here is how you can find the newest pin cheat! The Boot Buckle Pin! Step3.Click on the Boot Buckle pin. Now you have the Boot Buckle pin! Step3.Click on the furniture catalog. Step4.Click on the tree stump. Now you have the Clover Balloon Cheat! Step5.Stay on the same page. Step6.Click on the stone thing on the Wishing Well. You now have the Clover Garland Cheat! Step8.Click on the Mail Box. You now have the Blue Lamp Cheat! And those were all the newest cheats for the catalog! Thats all of it hope this helps! P.S. I just took my Oxford Acadamy entrance exam wish me luck that i passed. P.S.S. Pokemon H.H. and S.S. is released tommorow!